This collection illustrates a beautiful early morning walk in the woods, when the newly damp air is greeted by waves of dancing mushroom blooms and graceful garden snails. The collection was named after the small wonders under the timber trees. Be inspired! Take a tour of our October ’14 Quilt Market booth. Designer Elizabeth Olwen shares more of her talents with this brilliant Grey Abbey Look Book – so many inspirational images! Enjoy! In the Forest has such nice vibrant monochromatic accent prints we felt this project was a great way to highlight 2 sparkling fabrics at once. What’s nice is that you can use fat quarters for these 16″ pillows, too. Get the tutorial download here. A pile of pillows is all that’s required. Milk and cookies is just icing on the cake! This jumbo square (the green variety of foam) which measures 24″ x 24″ x 6″ was a find at Joann’s and with the discount coupon was a great bargain. It’s light enough for a little guy to tug around – especially with the help of a handle on the side. Double sided in Moon & Sun with Midnight Sky around the edges and Branches as handles and piping, it just invites the kiddies to dive on it. Catherine, who sewed all these wonderful items, said it was a struggle to get the cushion into the case, which is hand sewn on (not removable)- but perhaps a nice long hidden zip the full width of a side would have made it much simpler- and certainly easier to clean should the need arise. We topped it with a couple of pillows in Branches and Woolen Blanket. The ruffles add a touch of whimsy… even this little action hero dude can’t deny they’re fun. 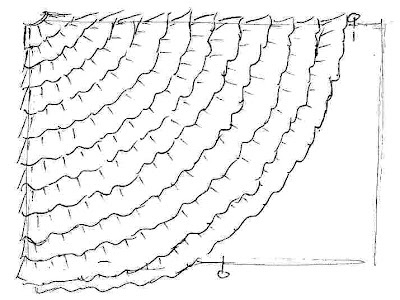 Jaclyn sent over some sketches and general directions to help you make your own Ruffled Fan Pillow. 1. Start with a base fabric that is the dimensions of your pillow, plus 1/2″ for seam allowance. We used a black solid for contrast. 2. Mark with pins where you want the ruffles to end. For ours, we went nearly to the top right corner and about midway along the bottom. This will give the background a chance to peek through without it being too top heavy with ruffles. 3. 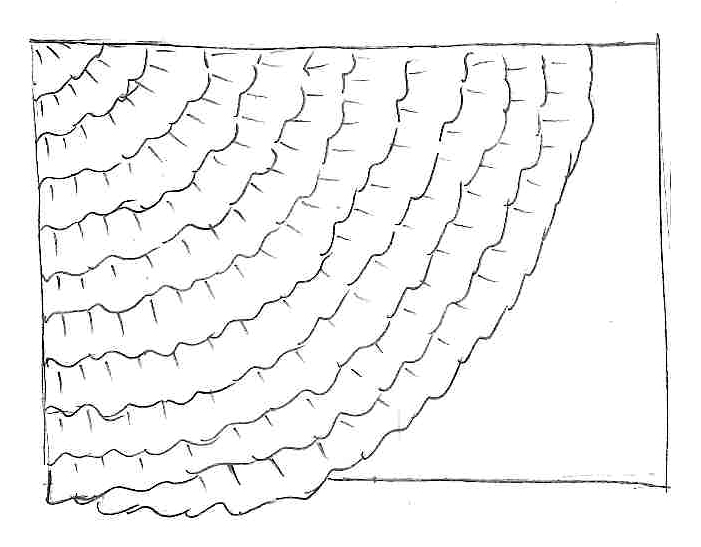 Our ruffles are made using a pinked edge only. They are not clean finished and so, yes, they’ll fray a bit, but that’s part of the look for this project. 3a. Cut ruffle strips 2″ wide and approximately 2 1/2x the length that you will need in the end (so if you need 1 ft of ruffle, then make the strip 2 1/2 ft). You may need to join strips together to get to your desired length. 3b. Jaclyn used a ruffler attachment (lucky gal for having one! 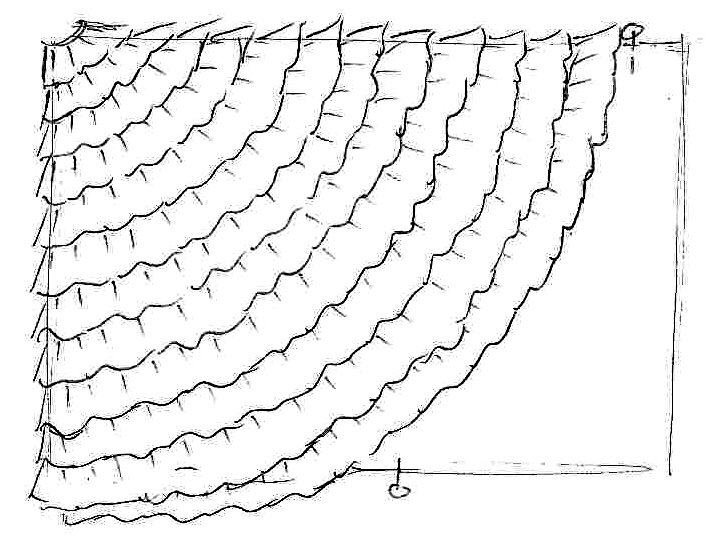 ), but it’s fairly easy to make ruffles using this simple method below. 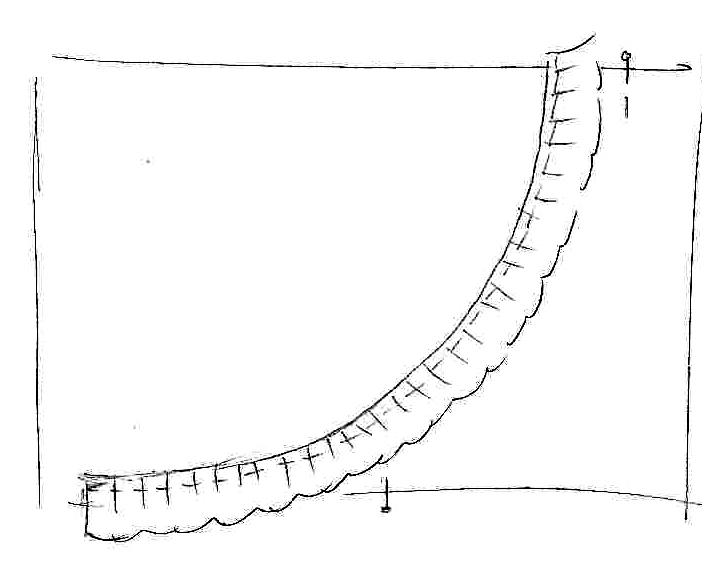 Making ruffles without a gathering foot: Cut your pre-measured strips. Set your machine to baste- or hand baste- 1/4″ from the edge of the fabric, leaving about 3-4″ of loose ends. Then go back and baste another row about 3/8″ from edge of fabric. While holding the end of the loose threads, pull the other ends (at same time) and using your fingers of the same hand, push the fabric back to create gathers until you’ve reached your desired length. Once there, tie off the ends so the ruffle doesn’t undo itself. Evenly distribute the gathers and pin every few inches to keep it from sliding around. Go back to your machine with a regular stitch and sew through all the puckers 1/4″ from edge, over the basting. Then go back and stitch again on the 3/8″ mark. 4. Starting at the points marked on the base fabric, arrange the ruffle in a curve and stitch to base fabric 1/4″ from ruffle edge. Be sure to leave 1/4″ extension of the ruffle over the edge of the base fabric for catching into seams when sewing pillow top to back. 5. 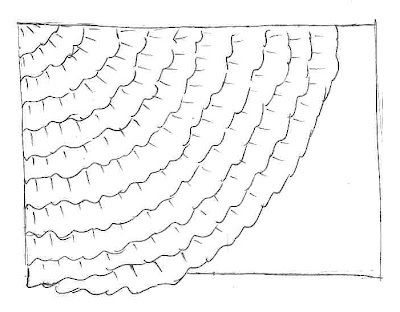 Arrange your next ruffle over the first sewn ruffle, covering the stitches of the first ruffle. 6. Continuing layering ruffles on top of one another, stitching each as you go until you reach the left corner. 8. We used a simple envelope closure by using two panels of overlapping fabric with finished edges on the interior. Arrange them face down on the right side of the ruffled panel. Sew all along the edge of pillow using 1/4″ seam allowance. 9. Turn right side out and press ruffles with iron to flatten them down a bit. Last minute projects are nothing new in my world. However, I’m pleased as punch to have made this with enough time to spare that I can give you a tutorial- and if you’re a last-minute doer like myself, you’ll find you can make this up in no time at all. This little Pocket Full of Love Pillow project will sure to please, especially if filled with your loved one’s favorite goodies. Download the heart template HERE. Please note, this is to printed on tabloid 11×17 paper. 1. Cut pieces as shown below. I used the same fabric (Moss | Crimson) of the front accent, pocket and back. You can use any combination of fabrics and hopefully you can find a little treasure of a print to put in the center square. I used Leaves | Crimson as horizontal accent and a tree from Grove | Straw for the highlight. 2. Assemble the horizontal strip. Press seams away from the center square. 3. Assemble the other strips of fabric as shown. 4. Fold the pocket fabric in half and press. 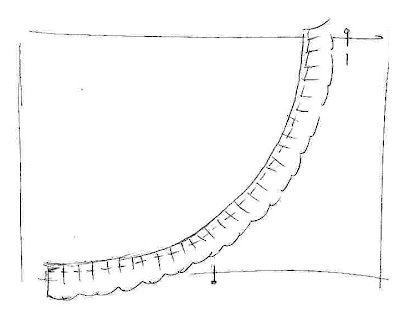 The folded edge should be on top. 5. With the front panel face up, lay pocket so it sits at the bottom edge of the vertical stripe. Last, lay the backing fabric face down. 6. Position the heart template – be sure to keep the horizontal stripe perpendicular and within the widest part of the heart. Pin well- especially around the pocket- and cut through all thicknesses. 7. Remove pattern piece and re-pin. Sew all around heart leaving about 2″ opening in the straight area at the bottom edge for stuffing. Pivot cleanly at the “v” at the top of the heart. Snip the tip of the bottom of the heart. Also snip the “v” but be very careful not to snip too close to the stitching as it may pull apart. Reinforcing this area with another pass of the sewing machine would be helpful. 8. Turn inside out, press open seams, making a nice smooth curve along the top and top sides of the heart. Stuff with your fiber fill of choice and hand sew close. *Don’t over-stuff as is may contort your pillow- also making it hard to slip things in the pocket. 9. Add your love notes, some sweets, a card and rest on the bed waiting for your true love to happen upon it. 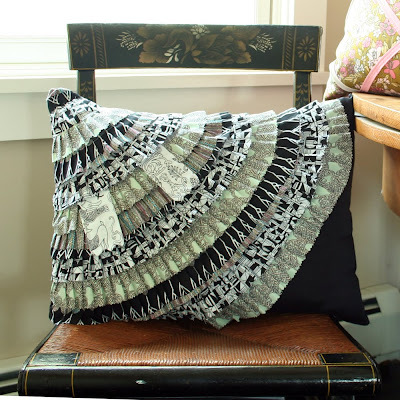 This tiny accent pillow project can be easily adapted to any size pillow form. This form is 10 x 16, but it is not a common size, so we’ve omitted exact measurements and rather, gave approximates and proportions. This went together VERY easily. No fusing was used for the appliqué, but it would be a great help for this. Before starting, you should consider the overall dimensions of your final product. It’s recommended to give a little wiggle room to your pillow case, so add an inch to the pillow form’s dimension. For example, if your pillow form is 12×12, plan for a 13×13 finished case. Also, pre-wash and shrink your fabrics! Initial is about 1/3 the width of the finished pillow case. If your case will measure 13″ w, then make the letter approx. 4.5″ w. Use your judgement on height/width depending on the font and shape of the letter. Center Panel is about twice as wide as the side panels. 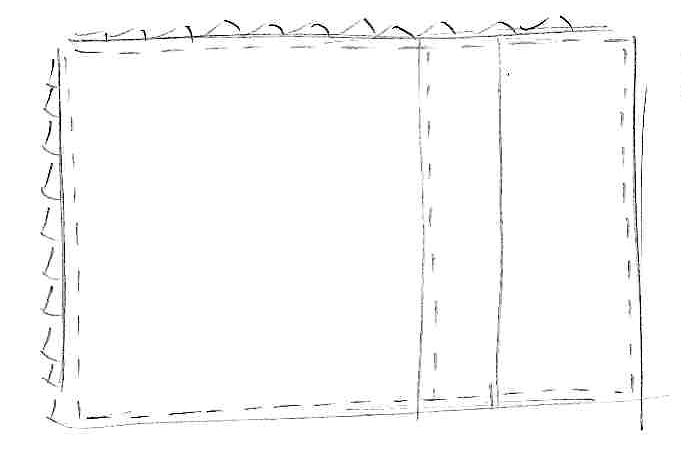 Add 1/2″ seam allowance to ALL sides of all panels, which equals 1″ total to height and width. For 13″ w (finished), the center panel may measure 6.5″ w x 13″ h (finished), therefore cut pieces would be plus 1″ seam allowance = 7.5″ w x 14″ h.
Side Panels (cut 2) would be 1/4″ of the width each. That would make them 3.25″ w x 13″ h (finished), the cut pieces would be 4.25″ w x 14″ h…. still with me??! Almost done with the math portion! 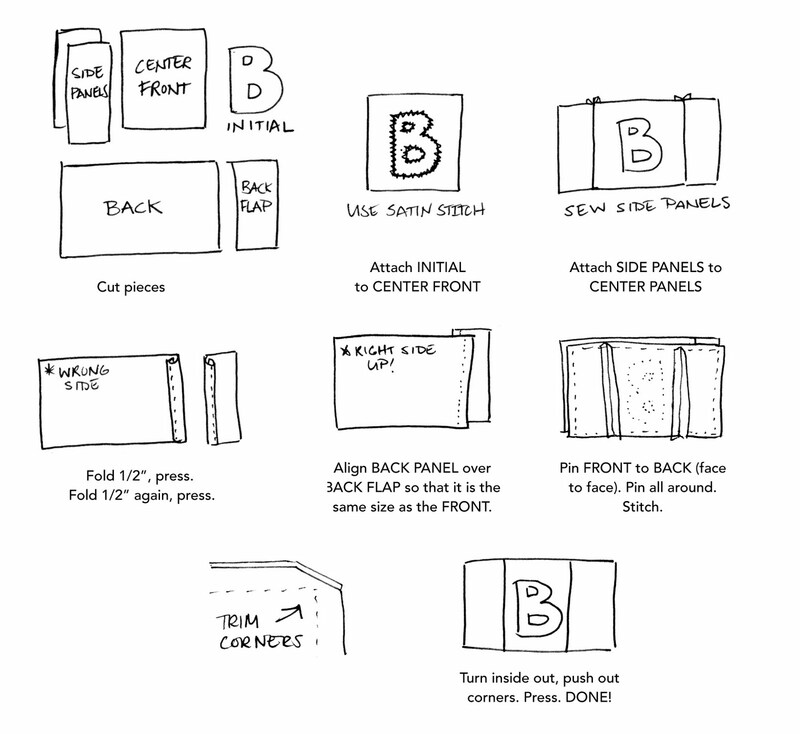 Back Panel is the exact width of the final pillow case, only add 1/2″ seam allowance to ALL sides. 14″ w x 14″ h.
Back Flap is 5″ wide and as high as the Back Panel piece. 5″ w x 14″ h.
Whew! All done with THAT. On to the fun part. 1. To create the Initial itself, we just typed and printed out a big letter B from our design program. Even if you don’t have a design program, it’s possible to use Word, too. Maybe even your email program. Just make the font as large as you can, then print it out to the scale you want. The font I chose was Aachen Bold. Bold letters will be easier to work with. 2. If you’re going to use fusible webbing, you should attach that to the back of the Initial Fabric before cutting it out. Cut out the letter from the paper, then trace the letter to the backside of the fabric- be sure to reverse the direction of the letter so it’s correct on the front. 3. Attach the letter to the center of the Center Panel. Fuse or pin well. Using a zig zag stitch at its widest setting and tightest stitch*, make a satin stitch the entire perimeter of the letter. *It would be best to test this on two thickness of scrap flannel before doing it on your project. Tensions, stitch width, etc. can all vary, so test it with your machine first until you’re satisfied with the results. 4. Next, attach the Side Panels to the Center Panel one on each side. Press the seams out flat. 5. 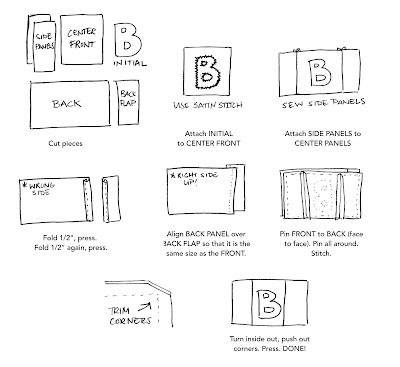 On the large Back Panel, take the right edge on the wrong side, fold 1/2″. Press. Fold over another 1/2″ again. Press. Pin. 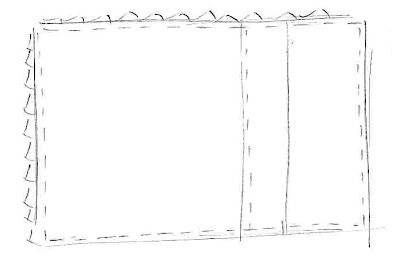 Topstitch through all thicknesses a scant 1/2″ from edge. 6. Do the same to the Back Flap, only do it on the left edge. 7. Facing up, overlap the Back Panel’s sewn edge over the Back Flap’s sewn edge and adjust until the combined width is the same as the width on the pillow Front. 8. Place pillow Front face down on the back pieces (so facing sides together). Pin through all thickness around the perimeter. 9. 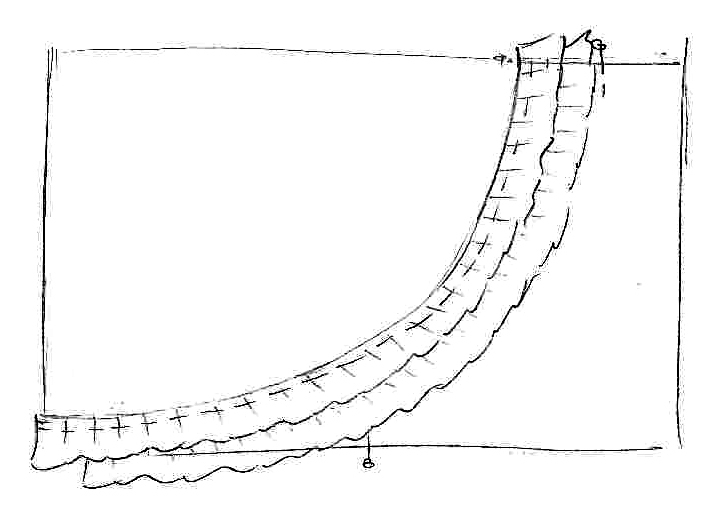 Starting in the middle of any side, stitch 1/2″ from edge all the way around the pillow, pivoting at each corner. 11. Turn inside out and using a boning tool or something pointy but not sharp, push out the corners making them neat. 12. Press the whole thing neat at the edges, then slip your pillow form in.